Here are some snazzy birthday facts about 16th of July 1986 that no one tells you about. Don’t wait a minute longer and jump in using the content links below. Average read time of 11 minutes. Enjoy! What day was my birthday Jul 16, 1986? July 16, 1986 was a Wednesday and it was the 197th day of the year 1986. It was the 29th Wednesday of that year. The next time you can reuse your old 1986 calendar will be in 2025. Both calendars will be exactly the same! This is assuming you are not interested in the dates for Easter and other irregular holidays that are based on a lunisolar calendar. 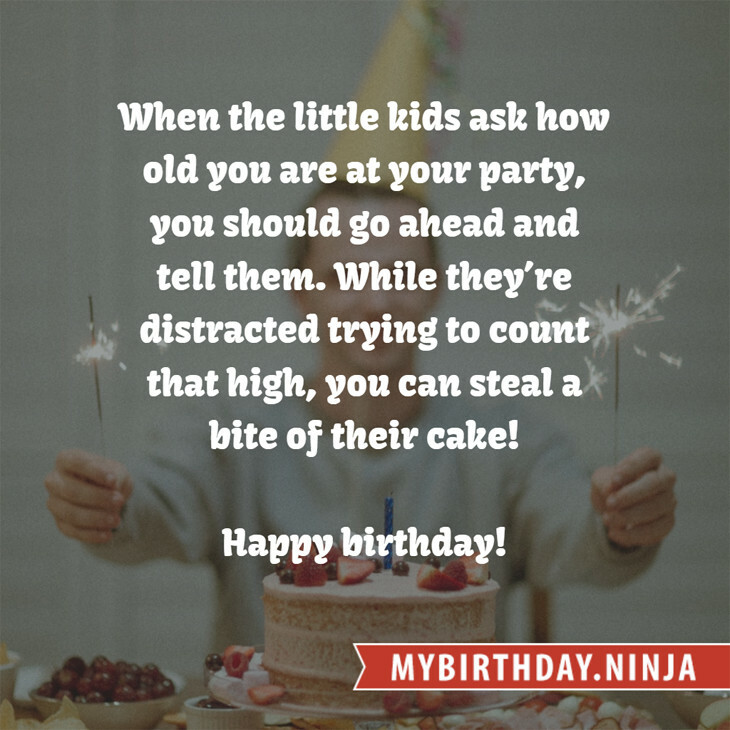 There are 88 days left before your next birthday. You will be 33 years old when that day comes. There have been 11,965 days from the day you were born up to today. If you’ve been sleeping 8 hours daily since birth, then you have slept a total of 3,988 days or 10.92 years. You spent 33% of your life sleeping. Since night and day always follow each other, there were precisely 405 full moons after you were born up to this day. How many of them did you see? The next full moon that you can see will be on April 19 at 11:14:00 GMT – Friday. Fun stat: Your first one billion seconds (1,000,000,000) happened sometime on March 24, 2018. If a dog named Jellybean - a Silky Terrier breed, was born on the same date as you then it will be 148 dog years old today. A dog’s first human year is equal to 15 dog years. Dogs age differently depending on breed and size. When you reach the age of 6 Jellybean will be 40 dog years old. From that point forward a small-sized dog like Jellybean will age 4 dog years for every human year. The District of Columbia is established as the capital of the United States after signature of the Residence Act. American Civil War: At the order of President Abraham Lincoln, Union troops begin a 25-mile march into Virginia for what will become the First Battle of Bull Run, the first major land battle of the war. Augusto César Sandino leads a raid on U.S. Marines and Nicaraguan Guardia Nacional that had been sent to apprehend him in the village of Ocotal, but is repulsed by one of the first dive-bombing attacks in history. Holocaust: Vel‘ d'Hiv Roundup (Rafle du Vel’d'Hiv): The government of Vichy France orders the mass arrest of 13,152 Jews who are held at the Winter Velodrome in Paris before deportation to Auschwitz. World War II: The heavy cruiser USS Indianapolis leaves San Francisco with parts for the atomic bomb “Little Boy” bound for Tinian Island. The Parliament of the Ukrainian SSR declares state sovereignty over the territory of the Ukrainian SSR. What does my birthday July 16, 1986 mean? Your birthday numbers 7, 16, and 1986 reveal that your Life Path number is 2. It represents balance, harmony and partnership. You have the soul of an artist. You are a fine companion and possess a good sense of humor. Friends seek you out for your calming and peaceful company. The following celebrities also have the same life path number: Larry Manetti, Boris Christoff, Neil Peart, Brandon Rogers, Aya Hisakawa, Rita Ora, Paul Muller, Lucy Hale, Desmond Dekker, Jensen Atwood. 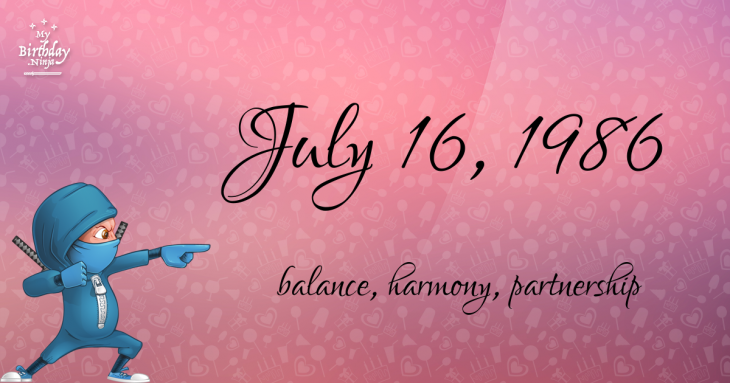 What is the birthday horoscope for Jul 16, 1986? The Western zodiac or sun sign of a person born on July 16 is Cancer ♋ (The Crab) – a cardinal sign with Water as Western element. The ruling planet is Moon – the celestial body of moods and emotions. According to the ancient art of Chinese astrology (or Eastern zodiac), Tiger is the mythical animal and Fire is the Eastern element of a person born on July 16, 1986. Fun fact: The birth flower for 16th July 1986 is Larkspur for haughtiness. What is the Love Match for Jul 16, 1986? When it comes to love and relationship, you are most compatible with a person born on September 28, 1965. You have a Love Match compatibility score of +128. Imagine being in love with your soul mate. On the negative side, you are most incompatible with a person born on January 25, 2002. Your incompatibility score is -114. You’ll be like a cat and a dog on a love-hate relationship. Arf-arf, I want to bite you. Meow-meow, stay away from me! The number-one hit song in the U.S. at the day of your birth was Invisible Touch by Genesis as compiled by Billboard Hot 100 (July 19, 1986). Ask your parents if they know this popular song. How many babies were born on July 16, 1986? Base on the data published by the United Nations Population Division, an estimated 137,616,130 babies were born throughout the world in the year 1986. The estimated number of babies born on 16th July 1986 is 377,030. That’s equivalent to 262 babies every minute. Try to imagine if all of them are crying at the same time. What is the popular baby name on 16 Jul 1986? Here’s a quick list of all the fun birthday facts about July 16, 1986. Celebrities, famous birthdays, historical events, and past life were excluded. Try another birth date of someone you know or try the birthday of these celebrities: August 26, 1908 – Aubrey Schenck, American screenwriter and producer (d. 1999); October 25, 1981 – Austin Winkler, American singer-songwriter (Hinder); November 14, 1921 – Brian Keith, American actor and director (d. 1997).